I'll be the first to admit that I have somewhat strange taste in food. If it's herby and a little out there, I'm sure to love it! When we go out to a fancy place, I usually pick the dish with ingredients I've never heard of in my life. Most of the time I can't get enough of it! I prefer to think of my taste as exotic and adventurous. I never have been simply a "meat & potatoes" kind of girl. I'd much rather have this dish than steak. Weird? I have a flamboyant side, ok! Anyway, Kale has recently become my favorite veggie. Seriously, I bought a HUGE bag on Monday and you really don't want to know how much is left. It is a great ingredient for so many dishes. I've tried a lot of things, but this is my favorite kale meal I've made so far. It's super easy and can be whipped up in under 30 minutes. Enjoy! Cook the quinoa as instructed on the box, but substitute the chicken broth for water. Meanwhile, gently steam the kale. 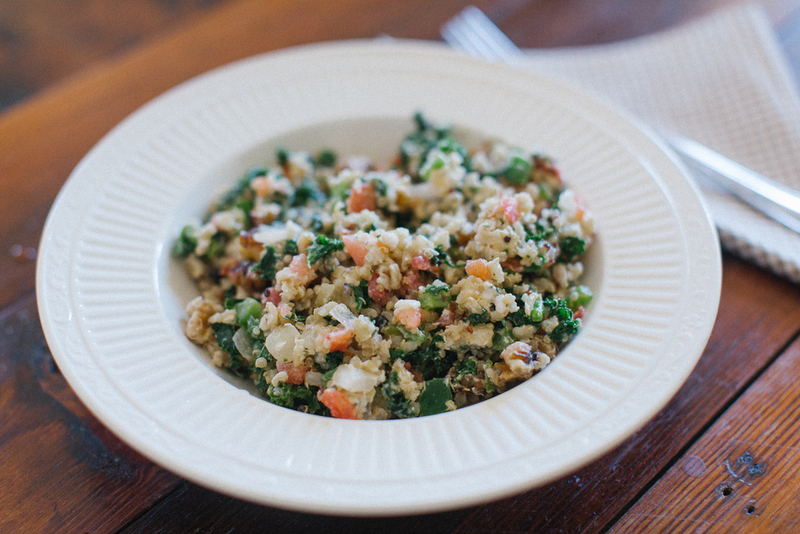 Once the quinoa and kale have cooled, mix them together with olive oil. Add whatever seasonings you like. Then mix in the tomatoes, onions, pepper and walnuts. Sprinkle some goat cheese on top just before serveing. Voila!